Wrap your wrist in elegance with a watch from the Chopard Imperiale collection! The lotus-shaped motif pays tribute to the past, when royalty wore embroidered gowns and nobles reigned. Many words may be used to describe Imperiale watches. They are feminine, have sculpted lines and fine details. All models have Roman numerals to mark the hours. There are 28mm, 36mm and 40mm sizes. Select from hour-minute and chronograph watches. Choose from stainless steel, rose gold, yellow gold, and two tone stainless steel and rose gold finishes. You will find dials in black, chocolate and Mother-of-Pearl, and more! 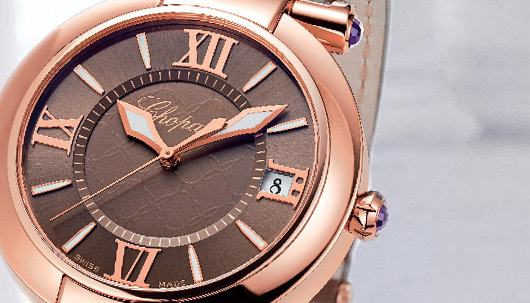 Be a modern-day empress with a Chopard Imperiale watch.